The culture of tattoos in Russian prisons is fascinating for people all around the world. Their intricate visual patterns and deep meanings are interesting to people completely outside of Russian culture. Movies like “Eastern Promises” bring to light the significance of tattoos in Russian criminal culture. 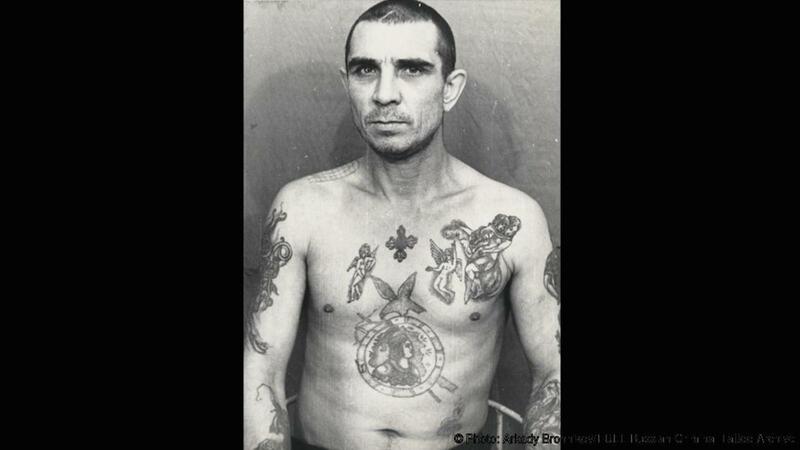 Tattoos play an important history in the evolution of Russian prison culture. The notion of criminals with distinct markings has a long history in Russia, since at least Medieval times. Hard labor was a typical punishment for many common crimes, even before the “Gulags” of the Soviet Union. Wikipedia describes the meanings of some of these brandings, which were precursors to many of the common Russian prison tattoos. They derive this information from a book titled “Russian criminal tattoo encyclopedia” and the “Encyclopedia of Body Adornment”. In the 19th century, a “pricked” cross on the left hand was often used to identify deserters from the army, and up until 1846, criminals sentenced to hard labor were branded “VOR” (thief), the letters on the forehead and cheeks. Brands were also applied to the shoulder blade and the right forearm, in three categories; “SK” for Ssylno-Katorzhny (hard labour convict), “SP” for Ssylno-Poselenets (hard labour deportee) and “B” for Begly (escapee). In 1846, VOR was replaced by “KAT”; the first three letters of the word for “hard labor convict” or katorzhnik. 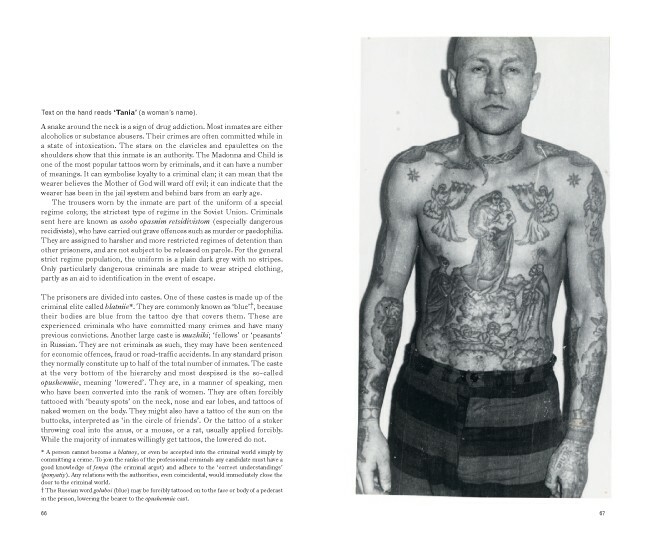 Tattoos last for life, and even when criminals eventually left the gulags, they carried their tattoos with them. 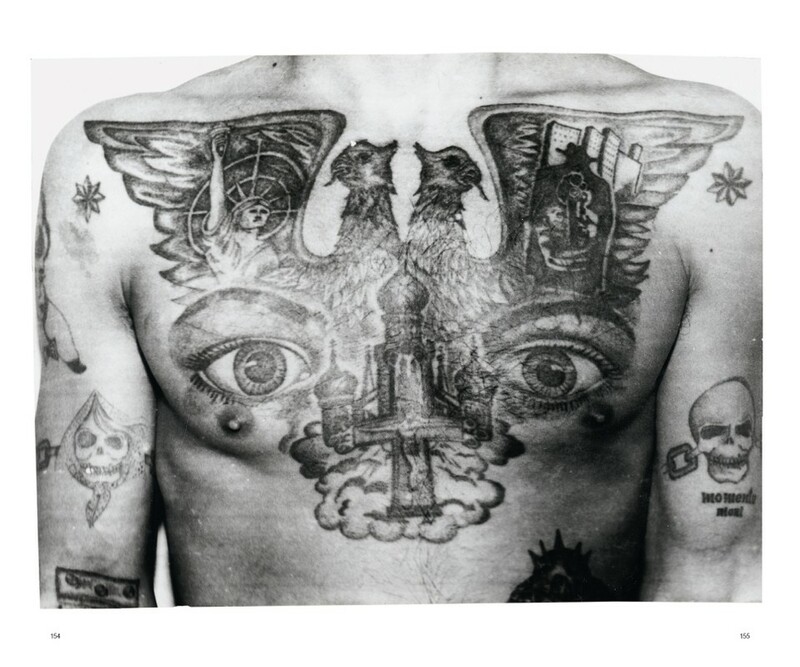 Over time, prison tattoos expanded to more significance within the general criminal culture in Russia. 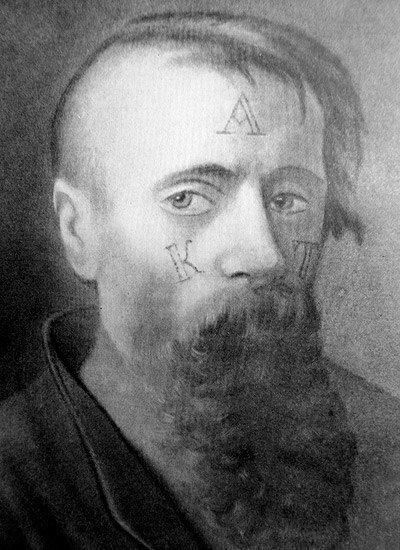 One particular group, known as the “Vor v Zakone” (translated to “Thief in law”) considered tattoos a rite of passage. These professional criminals use tattoos to indicate caste and status within their organization. They have official codes of conduct and their own ethics. 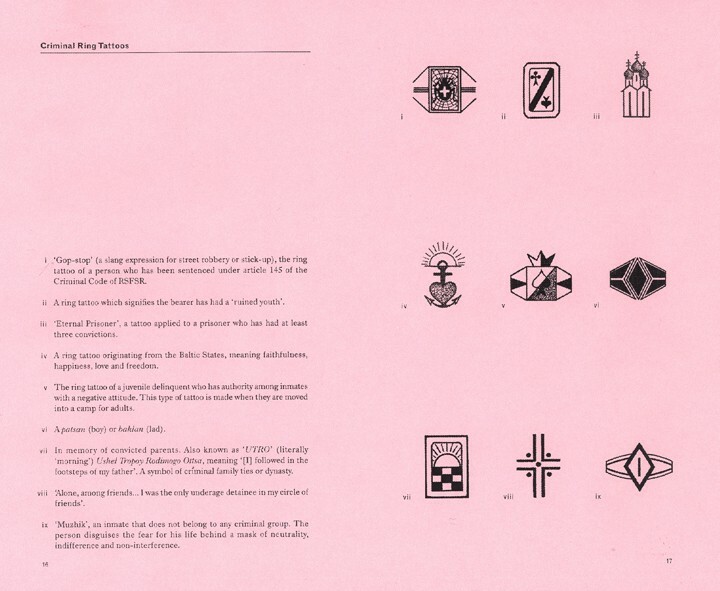 The BBC published an example of such tattoos, originally photographed by Arkady Bronnikov. Just from this short description of a specific group of tattoos, its clear that they can be very detailed and specific. Many subtle markings tell a subtle tale of the person’s ethics and life story. This history is very detailed and complicated. It’s full of conflicting tales, and lost stories. Very few people have truly done the research to uncover the true meanings behind all of these tattoos. Olga Gertcyk and Vera Salnitskaya interviewed one such historian named Arkady Bronnikov, the same person who took the photo published on that BBC article. 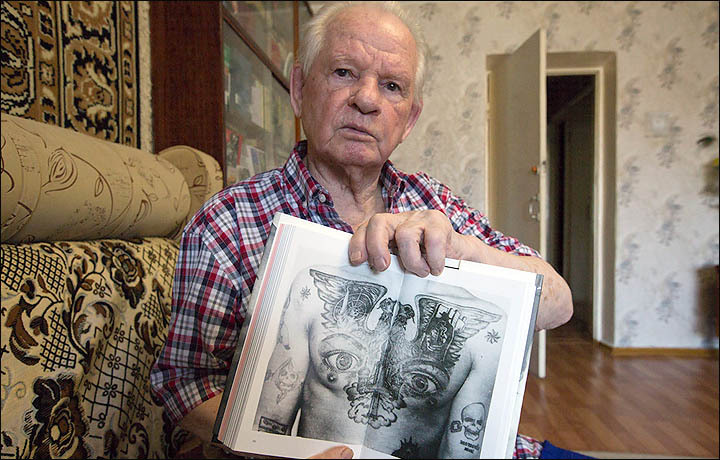 Arkady describes some examples or Russian prison tattoos. ‘Tattoos can tell important things about a person, for example, how many times he was jailed. The body is often covered with clothes so they make tattoos as rings on fingers. One ring means one jail term. In my collection, there is a man with 16 rings. Russian prisoners tattoos are a unique artifact in the world of tattoos. In Russian prison society, a criminal is expected to stand up for their tattoos and all the specific meanings they represent. 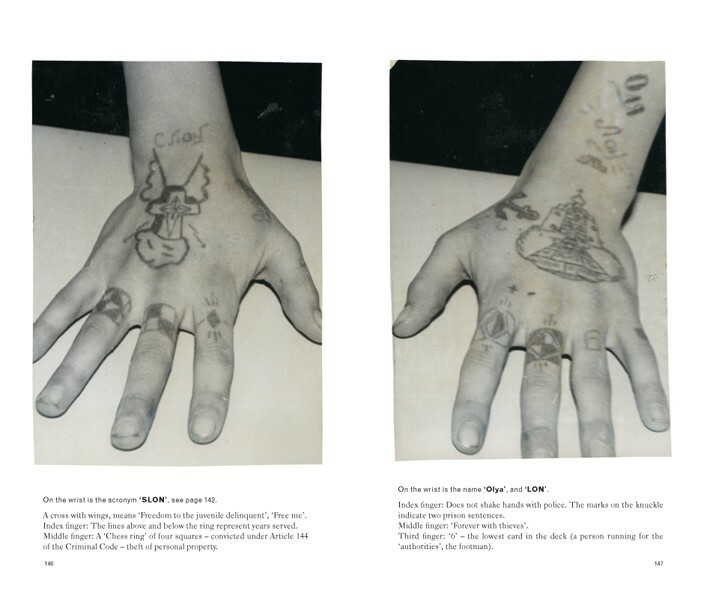 Anyone caught with a ‘false’ tattoo, is expected to receive abuse from other prisoners. From their brutal history in branding to their modern presence in organized crime, prison tattoos are important cultural landmarks in Russia. 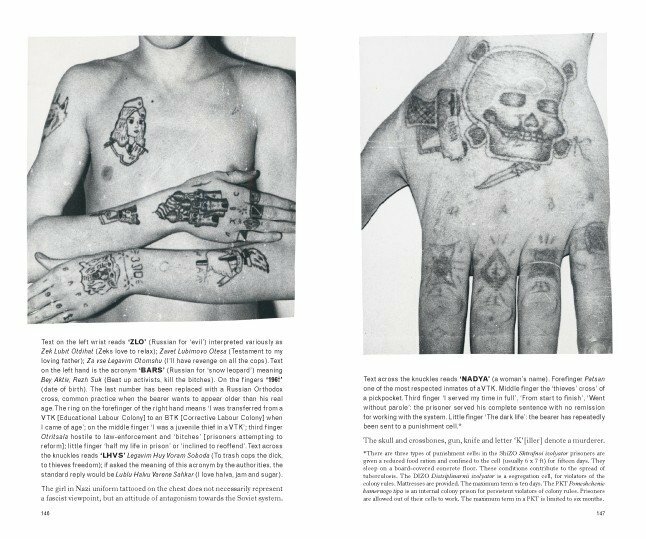 You can find more than 180 examples of Russian prison tattoos in the book by Akrady Bronnikov titled “Russian Criminal Tattoo Police Files: Volume I”. You can buy this book on fuel-design.com, to buy click the link below.